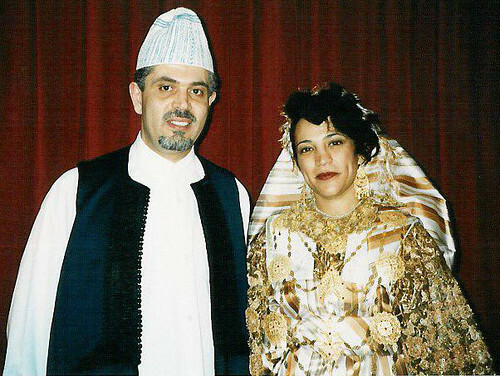 Friday, December 10th, was the twelfth anniversary of our wedding party، which actually took place on a Thursday back in 1998. Hana's family drove from Benghazi and Derna, mine from Tripoli and Misrata. I left Columbus on the 8th, and we all met in Djerba, a Tunisian island near the border with Libya. Many details had to be arranged, and most were done in advance, thanks to the internet, the phone and credit cards! It turned out to be a nice party. It was unconventional in some ways, which means the guests focused most of their attention on us, not on each other. So there were no fights! In fact, everyone seemed to be having a good time. A lot of the people had not met one another before, that might have provided a little cover of anonymity... and a little inhibition went out the door. lol lol OK, this was a party that had my father-in-law on stage with the dance band, in the presence of my mother. That could never happen in the conventional setting. It is fun to reflect on our anniversary and look all the way back from the perspective of the present. What about milk and Degla? Milk is clear enough. 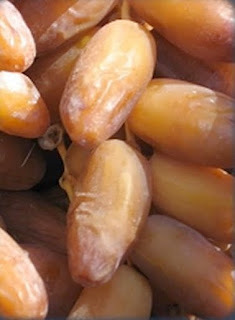 Degla is a date grown in North Africa and usually harvested in late fall. It has a delicate taste and texture and it appears translucent. Let me tell you a little background story that happened to me, also in Tunisia but on a different occasion. I was returning to my hotel one pre-noon, and I ran into a bus load of African tourists crowding the lobby. They appeared to be francophone tourists from sub-Saharan Africa, or as some Tunisians say, from "Afriqia el-Kahla"--black Africa. The receptionist, call him Hamza, was very busy trying to serve many people at once. As I wiggled my way through to the elevator, I greeted him with my usual (in Arabic) "Your day is milk, Hamza!" He glanced my way and swiftly replied, "No, today, it's Degla!" How do you take Hamza's statement? Some might think it is a sort of racist statement. The metaphor could be variously interpreted, depending on the eye of the observer. But think of how it might be interpreted if I said (in English) "Your day is ivory," and he replied, "No, today it's ebony" There is no implied superiority or hierarchy of value, and that's how I now think of Hamza's statement now. Life is not either black or white. It deals out light days and dark days, but even the dark ones can carry moments to be savored, moments when some light comes through. Those are the days of Degla. The others are the days of milk. The two complement one another very well! That's how I like to look at my years with Hannu, especially now as she fights cancer. Some days are bright like milk, some are dark, but like Degla they let some light through. Life is easier to swallow, if it can be viewed not as black and white, but as gratitude and hope, milk and degla. Hana and I stayed at the Hasdrubal Hotel in Djerba. They put a nice basket of seasonal fruits for us to enjoy. What sticks in my memory the most is what we had for our very first breakfast: milk and degla. The following is a little poem that I transcribed from an old tape I've had for many years. I don't know the name of the poet, I just know his voice! It hits on very traditional themes, and I hope it brings a smile to you, Hannu. May your darkest days be as sweet as degla.